Dimensions: 15.2 x 21.25 inches (38.6 cm x 54 cm). This lovely map of northern Africa is by Nicolas Sanson, Geographer to both King Louis XIII and Louis XIV of France. Sanson was one of the foremost cartographers of the 17th century and is often considered the father of French cartography. Born in Abbeville in 1600, Sanson was fortunate to receive a Jesuit education in nearby Amiens. His first love was history and it is said he became a mapmaker in order to better illustrate history and historical events and times. He began drawing maps at an early age and soon came to the attention of Cardinal Richelieu, Chief Minister to King Louis XIII. The king was so impressed that he asked that Sanson tutor him in geography, and soon thereafter Sanson was appointed Geographer to the King, a title which he retained under Louis XIV as well. Sanson eventually edited and published his works himself after a failed partnership with Melchior Tavernier, an engraver and dealer of maps in Paris. This elegant map features primarily Algeria, and is an excellent example of the blending of artistry and science which combined in Sanson, resulting in his becoming the premier French cartographer of his time. The coastline is depicted with precision and detail. All major cities and ports are noted. The topography is shown to be quite mountainous with numerous oases located and shown in the European manner of forests. Many rivers, lakes and other waterways are also meticulously depicted, as are cities, towns, settlements and fortresses. The ancient city of Constantina, founded by the Phoenicians is included. It is depicted by Sanson as being surrounded by water on all sides. A natural fortress, the city occupies a rocky diamond-shaped plateau that is surrounded except at the southwest by a precipitous gorge through the eastern side of which flows the Rhumel River. The site has been occupied since prehistoric times as is evidenced by caves in the cliffs of the gorge. A lovely drape-style title cartouche embellishes this elegant hand-colored map. Condition: This map is in B+ condition with light toning at the centerfold and a smudge at the left outer border. A centerfold separation has been repaired with archival material. 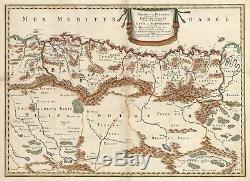 The item "1655 Partie de la Barbarie, ou est le Royaume dAlger divise en ses Provinces. P" is in sale since Tuesday, July 31, 2018. This item is in the category "Antiques\Maps, Atlases & Globes\Africa Maps". The seller is "hjb-antiquemaps" and is located in Chicago, Illinois.